Amman (Agenzia Fides) - Schools in Jordan belonging to the Latin Patriarchate of Jerusalem protested vehemently against the Al Wakeel website which recently caused scandal among the Christians of the Hashemite Kingdom with irreverent images of Jesus and the Apostles in the scene of the Last Supper. The image in question showed a prominent Turk chief among those serving Jesus and the Apostles at the Last Supper. In a statement diffused on behalf of all the entire staff, Muslim and Christian, Latin Patriarchate Schools present in Jordan criticised the desacralizing action, calling on the Ministry of Education to denounce and pursue this insult to Christians also at the judiciary level. At this difficult time lived by Jordanian society – say the directors of Latin Patriarchate Schools – this sort of behaviour threatens to increase sentiments of intolerance and refusal of others. In this regard the spokespersons of the Latin Patriarchate Schools ask for a speedier process of updating school curricula, removing all contents which might be used to foment sectarian sentiments among pupils of every order and grade. Wakeel website has removed the offensive image and diffused an apology explaining that there was no intention to offend “the Christian brothers and sister in our beloved homeland”. The website directors said the offensive image was published by a staff member by mistake and that disciplinary measures against him would be taken. 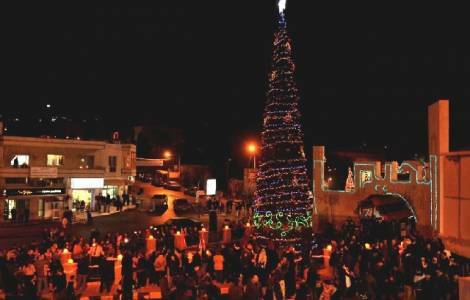 A committee of Christians in Fuheis, a town some 15km northwest of Amman, and 95 per cent Christian addressed the issue hypothizing that the decision on the part of the website in the imminence of celebrations for Christmas, might aim also to distract public opinion in Jordan at a delicate social and political moment in the Hashemite Kingdom with growing dissent and protests regarding rising costs of living and the spreading phenomenon of corruption . (GV) (Agenzia Fides 10/12/2018).